ECHINODERMATA : VALVATIDA : Poraniidae STARFISH, SEA URCHINS, ETC. 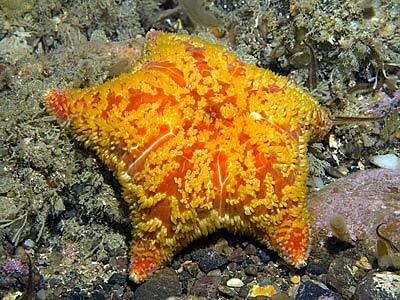 Description: A smooth, fleshy red or orange starfish with white or transparent soft papulae projecting from the back in life. The arms are very short and the disc large. There are white streaks and lines across the back and the surface is smooth and greasy to touch. Up to 12cm. across. 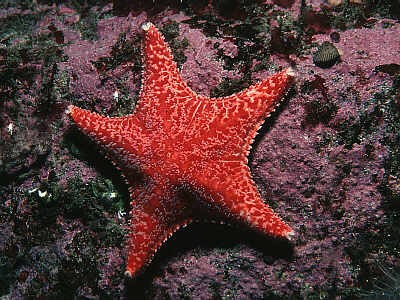 Habitat: Often found on moderately exposed rocks, sometimes apparently eating dead-mens fingers (Alcyonium digitatum). Also in more sheltered places, on wrecks and amongst boulders. Distribution: Southern, western and northern coasts of the British Isles, apparently commoner in the north. Similar Species: Asterina gibbosa is similar in shape but much smaller and green in colour. Cushion like body with short arms. Picton, B.E. & Morrow, C.C. (2016). Porania pulvillus (O F Müller, 1776). [In] Encyclopedia of Marine Life of Britain and Ireland.